Hi homeschoolers! Today I am sharing a fun unit study I created on the state of Colorado. Most states encourage (some even require) you to do a unit study on your home state sometime during a student’s fourth grade year of studies. Since we live in “Colorful Colorado”, we’ll be doing our unit this year with Turbo and Strawberry Shortcake. My Colorado Unit Study includes teacher lesson plans, student worksheets, field trip ideas, and more fun things to do in the beautiful state of Colorado! As I mentioned there are a total of 42 daily lessons in this unit. they will take approximately 30-45 minutes depending on the activity. We will be doing it 3 days per week, but you’re welcome to adjust it to fit the needs of your schedule. I have geared this unit for elementary aged students, but it can be also completed by older students if applicable. 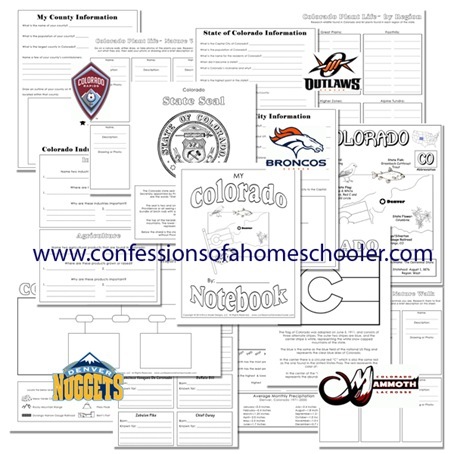 –> Download the Colorado Unit Study here! Now before you all ask for more states, I will not be creating individual state studies unfortunately. However you can grab my Road Trip USA curriculum if you’d like to learn more about our wonderful United States of America! I had emailed you a few months back about your Road Trip Curriculum and shared my blog link with you (we live in Wyoming). Last week my husband accepted a job in downtown Denver and we will be moving! I do believe you live in Colorado and was wondering what areas around Denver you like (if you are familiar with any of them). Thanks in advance! We just moved out of CO to FL. Golden is really nice and not too far from Denver. We lived in CO Springs, which is about an hour from Denver. I’ve been researching a solid, in depth state geography curriculum for days and this is the absolute best one I’ve found. I just ordered it for our 2014-2015 school year. I can’t wait to start it with my 5th and 2nd graders next month. Thank you! Thank you so much! This will be great! Thank you for sharing this unit about Colorado. I have forgotten to study this with my kiddos. I will be fun to explore our wonderful State. Thank you so much for this unit study. We live out on the eastern plains of Colorado just outside of Roggen. I am so glad to have found this as I’ve been wondering what resource to use to teach the kiddos about Colorado this year. Thanks again!